Finding product favorites isn't exactly hard, clearly - but figuring out which are my favorite things is also good for figuring out what to buy, what to pass on and what to wait on until it goes on sale. In case you missed my previous Currently Craving posts, here are January's, February's and from March. Gold Pineapple Luau Candle: I bought this from Bath and Body Works during the $12.50 three wick candle sale last week and I fell in LOVE! when it came yesterday. I wasn't sure if I would like it and I usually don't buy candles online unless I know I love the scent (because like I always say, we still have no smellivision even though it's 2016...) but this is so fresh and perfect for the kitchen or dining room. They make it in foaming soap too, so that's next on my list. David Yurman Link Bracelet: link bracelets have become pretty popular over the past year or so and I'm considering getting this Yurman as a grad gift to myself! It has blue sapphire on the ends which is my birthstone, an even bigger sign that I need it! I love the way Yurmans look together and with other bracelets so it would make for a fun addition to any arm party. Tassel Keychain: I found this the other day and bought it in all three colors! It's almost an exact dupe of this Rebecca Minkoff key chain and the best part is it's $5!!! Colorful Tassel Pillow: I'm not sure what's more real.. the tassel obsession or pillow obsession! Changing up pillows for summer is a fun refresh and who could resist with pillows that are as cute as this one! Nautical Rope Belt: I'm not a big belt person, but sometimes it's necessary. I love this cute nautical looking belt for jeans or shorts in the summer! Scalloped Sandals: are these not the cutest?! Another obsession, scallop detailing! Speaking of scallop detailing I also love this shirt, perfect for summer. Bare Minerals Face Primer: since I can never find a face primer I really love, I've been trying them out as it's been getting warmer out and so far, so good with this one! It leaves my face feeling fresh, not sticky and it seems to be perfect in the sun and warm weather. Gemstone Earring Jackets: these earrings are simple and cute and can be dressed up or down! I love earrings jackets, they're so easy to dress up or down. Gold Pineapple Candle: if only I could have allll the pineapple things in the world! This candle is a mini version of some of the bigger ones that have become so popular and it's been so hard to find... I went to both Target's near me and neither had it, so I finally ordered it online. It's going to go on the tray on my bathroom counter; a fun little DIY I have going on that I can't wait to share! Pineapple Tshirt: ...do I really have to say any more?! I can hardly wait until this comes! 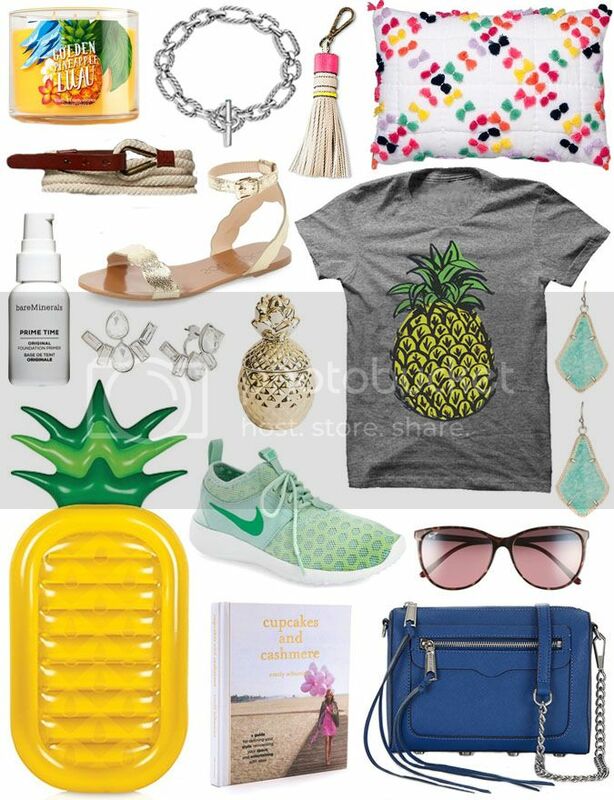 It's by far the cutest pineapple tee I've seen and I can't wait to style it for summer. Mint Green Kendra Scott Earrings: these are my favorite shaped earrings in the entire Kendra collection! I got them in this month's Rocksbox and had to keep them. You can try them and similar ones out too in a Rocksbox for FREE for your first month with code dailydoseofdesignxoxo! Get as many boxes as you can ship back in the months time and if you're not totally satisfied, you can cancel before you get billed. Getting a new box in the mail is the best and so much fun to open it and see what your personal stylist picks for you each time! Give it a try! Mint Nikes: this time of year makes me want to go on walks, sometimes runs (sometimes being the key word) and especially if it's by the beach! I've heard so many great things about this model and I can't wait to try them! Sunnies: I"m always on the lookout for fun new sunglasses and these Maui Jim tortoise shell pair stands out from any other similar ones I've seen. I haven't heard of this brand before, but now that I have I'm loving all of these! Cupcakes & Cashmere Book: I'm always adding books to my coffee table/shelving displays and this is the newest to my collection - there is SO much home inspo in this and it's such a fun read, highly recommend! Rebecca Minkoff Crossbody: I just bought this bag and I cannot WAIT to get it in! Rebecca Minkoff has the prettiest blues in her collection so I'm super excited to see this in person. What are you loving this month? Happy (almost) May! Loving all of the pineapple stuff. I did a post dedicated solely to pineapples! The raft had made my list too! And I too feel like I always say that i can't believe another month has ended! These are awesome! I love the crossbody, I am a huge fan of bags with that style because it's so convenient especially when you're out running errands all day. These favorites are making me miss the beach!!! I need a new pair of Nikes, as my are starting to fall apart. I love this mint green ones. And that Rebecca Minkoff purse is too cute. I've been wanting one for so long. I got the pineapple candle too. LOOOOOVE my house smelling like hawaii <3 also need that pineapple shirt. I am obsessed with pineapples and palm trees. I even have a palm tree tattoo!! I need that candle and also that bag is so cute. I'm loving the bracelet and the cross body bag. Great picks! Lots of cool things here. I like the tassel pillow and the shoes! I am lovin the tshirt and earrings! So cute. That pool float is awesome too. I love the purse & and the shirt! They're so cute. These are some great choices. I love the top picture with the blue and yellow together. Loving that Mint colored Nike! The cross body bag looks cool too! I am also so in love with that rope belt. Very nice! I am just loving it, these are some wonderful products & these pineapple stuff are quiet amazing. The Pillow, the T-shirt & those earrings are the favorites for me among these great collection. I love this Rebecca Minkoff bag so much, it's gorgeous! And I also want to get myself a new pair of Nikes, they are so comfy for both running and walking! Great round up of products my favorite were the Kendra Scott Earings. I NEED this pool float! Wow. love all the selections you have here. Amazing favorites indeed! Loving those pineappe themed items! Especially the gold candle! It's so pretty I don't think I could use it, I'd just want it for display. Now I think I need those sandals. So cute! I'm looooving alllll things pineapple! I adore that gold candle from Target. They get me ever time! I love that pineapple pool float! I also love those black flip flops!